Darth Plagueis was a dark lord of the Sith so powerful and so wise, he could… even keep the ones he cared about from dying… The dark side of the Force is a pathway to many abilities, some considered to be unnatural. He became so powerful, the only thing he was afraid of was losing his power. After much disappointment expressed by the public over the quality and substance of the Prequel Trilogy—grudgingly accepted by diehard fans—comes a novel to save the day and save the prequels, especially Episodes I and II. James Luceno’s Darth Plagueis excellently brings together the seemingly scattered events of the prequels to not only tie up loose ends, but also offers greater understanding of these films and a greater appreciation of the Star Wars storyline. Better yet, Darth Plagueis is a novel that could speak volumes on behalf of the Austrian School! Let it be clear that this is unlike most Star Wars novels. It isn’t action-packed, but rather philosophical, explaining the teachings of the Sith, the logic for and against the Rule of Two, and the Grand Plan for the revenge of the Sith. Much like The Count of Monte Christo, Darth Plagueis uses politics, deception, and intrigue to move the plot forward over a chronological span of several decades. The novel also answers some pressing questions, including why Darth Maul was killed by a padawan and not a Jedi Master. Another is how and where Count Dooku came into the picture, his frustrations with the weakening Republic, how he would have become a Sith Lord, and why Dark Jedi are leaping out of every nook and cranny while the Rule of Two is still in effect. Some of the glimpses of the growing military industrial complex give insights on the development of the technology used by the Trade Federation, the Intergalactic Banking Clan, and the Techno Union which not only would make the droid army possible, but also the cyborg technology used to revive General Grievous and eventually Darth Vader. The novel even covers the open ends made in The Clone Wars series, including Darth Maul having a brother and a psycho godmother. Rest assured that this article contains some major spoilers, but critical for the brief analysis that must be included in this book review. 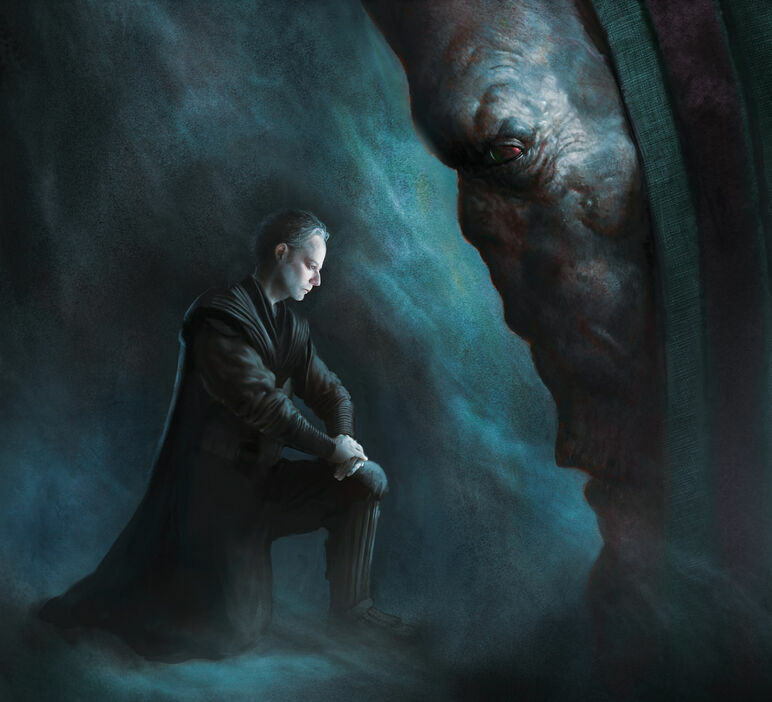 Darth Plagueis, known to his business associates as Hego Damask, is a seldom-known figure who mostly operates and does his transactions behind closed doors and out of the limelight, yet is one of the most powerful beings in the galaxy. He is personally responsible for setting in motion the chain of events that would lead to the rise of the Empire under Palpatine. Damask, Majister (both CEO and head of state) of the clandestine financial group Damask Holdings, follows the Muun species’ tradition of banking, finance, and acquisition of as much power as possible through the purchasing or seizure of assets, from accounts and properties to big businesses and even whole planets. Damask is a secret ally of the Intergalactic Banking Clan (the Star Wars version of the Federal Reserve), responsible not only for growing the military industrial complex, instigating the breakup of the Republic and the rise of the Empire, but also for selling weapons and financing both sides in the Clone Wars. One of the members of Damask Holdings, Larsh Hill, is Chairman of the IBC and will eventually be succeeded by his son San (seen in Episodes II and III as IBC Chairman and influential leader in Dooku’s Confederacy of Independent Systems). After Larsh’s death, San Hill would be personally mentored by Hego Damask. Damask Holdings was a clandestine financial group closely allied to the Intergalactic Banking Clan, which also acted as a lobbying and political pressure organization that involved itself in the affairs of many planets, both to exploit local resources—such as plasma—for financial gain, and to gain influence on a galactic scale as part of the secret Sith Grand Plan to topple the Galactic Republic. It also operated as a secret society, bringing together the galaxy’s most influential beings for the yearly gatherings on Sojourn, and also presiding over the steering committee. Case closed! If Hego Damask can be compared to J.P. Morgan, then the Hills are the Rockefellers, the world Sojourn being Jekyll Island and Damask Holdings being the first Federal Reserve Board, using the IBC and satellite firms like the Trade Federation to tighten their hold over the Republic, secure a future for the military industrial complex, and maintain their full monopoly on the control of trade, finance, and unbalanced government regulations. Damask, however, is much shrewder in his schemes and dealings than J.P. Morgan, though Morgan’s co-founding of the Fed and agitation to involve the United States in the First World War (to protect his European investments) makes him no amateur thug. Damask recruits as his Sith apprentice an ambitious young man from Naboo named Palpatine, simultaneously training him in the ways of the dark side of the Force and grooming him to become an influential Galactic Senator. Their methods are to acquire all the power necessary for undermining the Republic, Damask’s grand plan involving Palpatine acquiring political power and the reins of government, meanwhile himself acquiring increasing economic power through Damask Holdings and the IBC. Furthermore, Damask obsessively studies the nature of life, the Force, and Midi-chlorians in the hopes of achieving immortality so that Plagueis and Sidious may forever reign as emperors. This example is part of why your author respectfully disagrees with the neo-Rothbardian view that government is evil and everything that is good lies in privatization. (No, this is not because Rothbard hated Star Wars…) After all, it’s possible for thugs to control whole sections of the private sector and rule as dictators in an anarcho-capitalist society just like the public sector in a socialistic society, whereas in a Constitutional society with minimal, localized government and abundant, decentralized privatization there lies far less opportunity for the stripping of rights and increase of corruption through monopolies and absolute power. Luceno, James. Star Wars: Darth Plaqueis. Del Rey, Random House Publishing Group. 2012. pp. 166-67.